A few years ago, I noticed that an unusually high number of well-placed Nigerians were being reported in the media as having passed on in different hospitals and clinics outside the country. Once I started keeping tabs, two patterns clearly stood out. One was the sheer number of people expiring from various forms of cancer—breast, colon, lung, prostate, ovarian, etc. The second was the choice of—you get the point—final destination. From a totally random list I drew up of twenty-five people who had died within a ten-year period leading up to January 2014, I discovered that eleven had drawn their final breath in various medical establishments across the United States, followed by the United Kingdom with ten. India, then Spain and South Africa rounded out the list with two and one respectively. I felt a need to explain why the country had found itself in this impasse, and why all indicators pointed to the pattern subsisting for as long as the social and political habits that produced it were left unengaged. Underfunded and mismanaged, the Nigerian health sector is the epitome of the Nigerian condition. As a general rule, public hospitals in Nigeria do not have the capacity to diagnose simple ailments, regularly misdiagnose, lack qualified medical personnel, and are riddled by corruption. There is no better illustration of the distrust with which Nigerian hospitals are regarded than the fact that while I was writing this piece at the beginning of the third week of August 2017, incumbent President Muhammadu Buhari had spent several months in a London hospital, receiving treatment for an undisclosed ailment. Last year, he budgeted a princely $16 million for the State House Medical Center for the 2017 calendar year, more money than was set aside for all the country’s sixteen federal teaching hospitals combined. Ultimately, I was motivated by a simple desire to raise the temperature of public opinion in the country. In calling attention to the abandonment of public hospitals by the moneyed elite, I intended to use the steady deterioration of the health sector to provoke a broader reflection on the widening chasm between the reality of Nigeria’s democratic experience and the bright expectations that a majority of Nigerians had as the military era drew to a close at the end of the 1990s. In the early 1990s, I was a political reporter for a Lagos-based prodemocracy newsmagazine, TEMPO. By the late 1980s, most Nigerians had tired of the military’s grip on power. When the presidential election of June 12, 1993 became inconclusive after military despot Ibrahim Babangida abruptly canceled the results, the country was plunged into a lingering political morass. TEMPO was the arrowhead of mobilization by an irate civil society to have the cancellation reversed and the presumed winner of the election, millionaire businessman MKO Abiola, installed as president. Not least because it was dominated by an often bloody confrontation between a military state and civil society, the 1990s was a tense period in Nigerian history. Although Babangida eventually succumbed to pressure and vacated power in August 1993, the stooge interim government that he installed was listless, and it came as no surprise when it was taken down by another military general, Sani Abacha, in November of the same year. Abacha ruled Nigeria with an iciness that was unusual even for a country that was no stranger to military brutality. He chased the majority of the democratic opposition into exile and threw into detention those he could not dispatch with his squadron of goons. Yet, for all the general nervousness, this was also a period of febrile optimism. For one thing, the Miracle of June 12 (in which an electorate historically split along Christian-Muslim lines voted overwhelmingly for a Muslim-Muslim ticket) had transformed the collective mood, one that would not be dampened despite the election’s subsequent abrogation. For another, prodemocracy mobilization strengthened the sinews of civil society, signaling new prospects for common participation in democratic politics. Furthermore, an emergent elite centered on an uneasy coalition of civic and political leaders could not resist the temptation to paint pretty frescoes of the country’s prospects under a democratic dispensation. And because the military was so dastardly, it was easy to suggest, as many did, that the country would be automatically better off upon the arrival of democracy. As I recall, not even journalists were immune to this all-consuming sanguinity. Thus, one concern shared by many senior editors at the time was how to reposition the newspapering landscape the day after the military eventually retreated into their barracks. Across newsrooms, the fear was openly expressed that, with the military adversary properly retired, and with state and civil society finally concordant, kindling the public imagination (or was it just getting people to continue to buy their newspapers?) [one imagines Benedict Anderson’s acolytes wondering whether both are not in fact the same] was going to be a titanic task. Such was the mood then. If anyone considered the challenges that the post-military dispensation might bring with it, they mostly kept their opinion to themselves. Contemplating the contemporary Nigerian milieu, it is difficult to avoid the conclusion that democracy’s reputation for delivering the good life is massively inflated. That the country is in a different place, and this partly on account of it no longer being under military rule, is not in question. A new sensibility is certainly abroad; but so also is a creeping feeling, particularly among, but by no means limited to, those who fought at the barricades and welcomed the inauguration of the Fourth Republic with quiet satisfaction nearly two decades ago, that this is not exactly the world that they envisaged. Quite what the problem is can be difficult to summarize succinctly. For example, if regular elections are anything to go by, the country’s democracy is in fine fettle. Since 1999, Nigeria has held several elections at local, state, and federal levels. True, a majority of the elections were tainted by ethnic and sectional violence, and only a handful can be adjudged to have been totally free and fair. Yet, with the possible exception of the violence that broke out across several northern states following the April 2011 presidential vote, a violence that claimed an estimated eight hundred lives, postelection violence in Nigeria has been more or less manageable. And after then-incumbent Goodluck Jonathan conceded defeat and transferred power to opposition candidate Muhammadu Buhari in 2015, the country did attain another important milestone on the road to democratic consolidation. Thus, from all appearances, things are going well. But periodic elections can obscure as much as they reveal.2 They are perfectly liable to being coopted into a logic in which the practice of democracy is used to invalidate its very essence. This seems to be the case in Nigeria and other African countries (Kenya, Zimbabwe, and, increasingly, South Africa, come to mind) where sundry antidemocratic forces have shown greater tactility in adapting to the strictures of the new multiparty environment. In Nigeria, the uneasy coalition of civic and political leaders mentioned above did not last. Forged in the twilight of military rule, no sooner had day broken on civil rule and the elite realignments that were its inevitable appurtenance than it crumbled. In short order, key civic leaders would defect to the state, but by and large, the state did not return the compliment. Nor did it have to. Nigeria has always been a federalism in name only. During the military era, power flowed both from the barrel of the gun and the barrel of oil. In the Fourth Republic, with the gun finally holstered, oil reigns unchallenged as the master key to unlocking the Nigerian conundrum. When oil commands top dollar in the international market, as it memorably did in the 1970s when the country was awash with petro-Naira, and as it did most recently for large swaths of the Obasanjo (1999–2007) and Jonathan (2010–2015) eras, things can look rosy indeed in Nigeria. At all levels of government, and across those countless circles of affect where the logic of redistribution ultimately asserts itself, it becomes suddenly easier for elites to turn on the spigot of patronage; and while it lasts, the country can, and frequently does, forget its problems. It is when the bottom falls out of the oil market, as it unfortunately has over the past few years, that things tend to take a dark turn. When this happens, daily life reverberates with discontent, and, with common civilities in abeyance, the ensuing money struggles open the floodgates of untold misery and degradation. As I write, multiple Nigerian state governments are owing their workers a backlog of salaries going back, in some cases, as far as two years. Is This All There Is—To Democracy? Democracy has always had as many enthusiasts as critics, but over the past decade or so, it is the critics who have been most vociferous. For example, with his theorizing around the idea of post-democracy, political scientist Colin Crouch appears to have drilled down to the essence of a scholarly consensus that something is rotten at the very core of Western liberal democracy. In the United States, the uncertain aftermath of the election of Donald Trump as president has accentuated this feeling of democratic decay, allowing perennial reservations about the sustainability of liberal democracy, as articulated by scholars and commentators as apart in historical temporality and ideological temperament as Randolph Bourne, John Dewey, Claude Ake, Mahmood Mamdani, Noam Chomsky, and Elke Zuern, to rise to the surface. It is tempting, when beholding the turmoil in Western liberal democracies, to jump to the conclusion that democracies everywhere are afflicted in the same way. But this would only be partially correct. True, most currently contend with a populist upsurge, even if in different forms, and all feel the fury of rampant capitalism, though again, not in the same way. Nevertheless, I doubt whether the crisis of social democracy in any Western European country can be said to be of the same order as the travails of a country like Nigeria, whose situation increasingly resembles a permanent interregnum. While the vestiges of the old order persist, a new one remains frustratingly elusive. In view of this, when one takes a closer look, it would seem that the issue in Nigeria and other African countries in a similar limbo is not really that democracy has failed. Rather, there is a nagging sense that, precisely because the cables of its founding principles have, properly speaking, yet to be laid, democracy cannot be said to have been inaugurated. This probably explains the frequent crises across the continent around the question of citizenship. 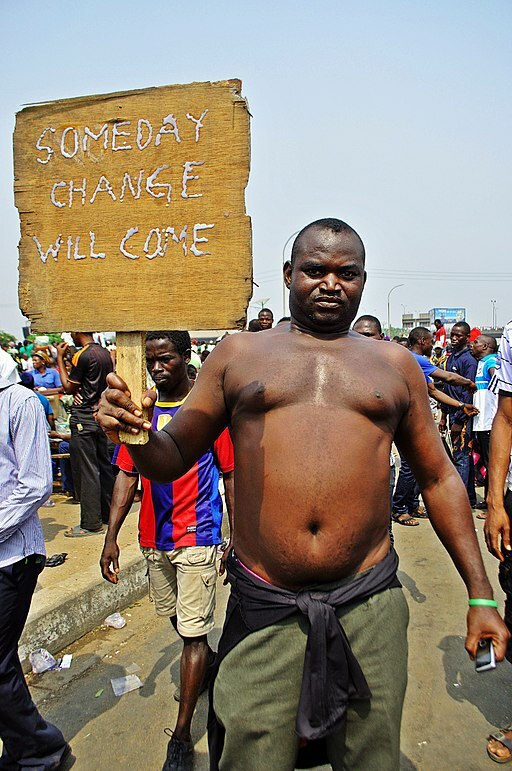 On the streets, where it all counts, philosophical debate on the status of Nigerian democracy can seem like a luxury. What matters is that almost twenty years on, ordinary people feel greatly disenchanted, and they wonder, appropriately, whether this is all there is.